If manufacturing is the “bread and butter” of your business, tool carts hold the “forks and knives” of your machinists, maintenance staff and other tool-bearing professionals. Heavy-duty tool carts are designed to carry heavy loads. But many of these loads are far too heavy for a person to move safely, especially on a regular basis. Some industrial tool carts offer capacities of more than 5,000 lbs., with even larger tool carts used in auto racing pits, for example. Unless you employ comic book superheroes, it’s hard to imagine anyone safely moving a two-and-a-half-ton cart around. A motorized solution can reduce injury, improve productivity and save money. These days, when payloads approach 2,000 lbs., or when push/pull forces exceed 35 to 50 lbs. of force, most companies seek a motorized solution for carts of all kinds. They find that the high amount of force needed to manually move a cart can cause worker injuries from excessive strain. Or, they realized after producing a cart or loading it up that the push/pull forces exceed their corporate ergonomic standards for safe movement. Some companies overlook the extra force needed to move a cart on inclines. One motorized option is to integrate a drive system under the tool cart. 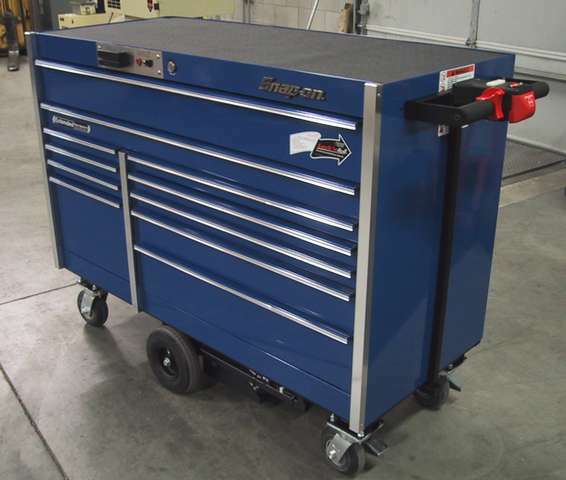 Our engineers can help determine a retrofit solution based on your tool cart’s payload capacity, its mobility needs, your corporate ergonomic standards and potential future needs. Another solution is to use a motorized tugger that attaches to the toolbox for safer, easier movement. A tugger is especially useful if you have multiple tool carts, allowing you to use one power unit to move any cart. The Pony Express 1065 Electric Tugger offers variable-speed forward and reverse control (from 0 to 3 mph in fast mode or 0 to 1.5 mph in slow mode), solid state regenerative braking and a holding brake to maintain tool cart positon on inclines, an emergency stop button, a unique ergonomic handle adjustable to different user heights, and more. Yes, it may be physically possible to manually move a multi-thousand-pound tool cart. But your business is not a strongman competition. Contact Electro Kinetic Technologies to discuss solutions for safer, easier-to-move tool carts.